Welll for the first evening ride of the summer that was cracker. Biggish crowd out, with a good flowing pace and no real delays or mechanicals. The bombhole was dry and dusty, and the singletrack out towards the Hole in the Wall from the start of Rocky Rooty was as good as it gets in the height of summer. Claggy John’s wasn’t even claggy ! All the usuals, Voodoo, v-notch climb were all riding a treat and once we got up the park and into Narnia, again it was dry and dusty. Me and Tim were remarking that exactly 3 weeks ago we rode, well actually pushed, up that trail, pushing ‘cos of the snow. 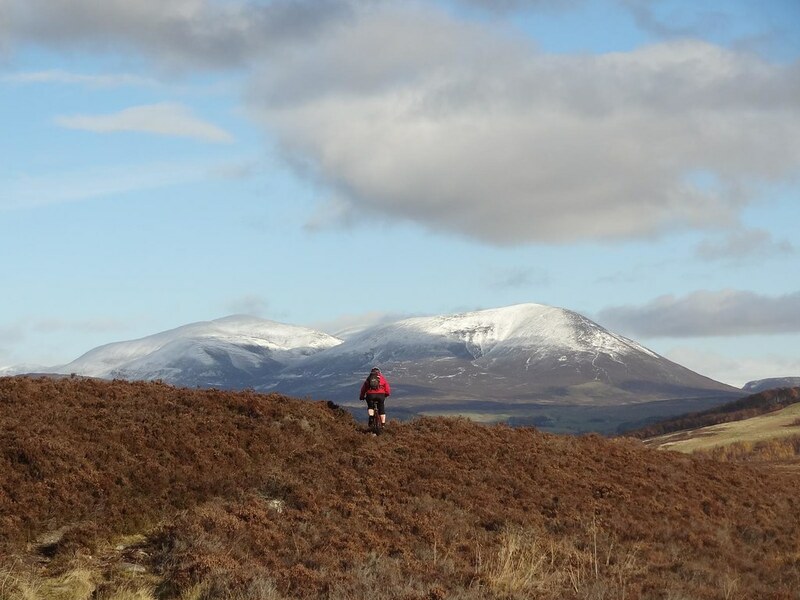 Three of us – Davie H, Gerry and myself – headed out from Colzium for the alternative Sunday ride, a tour of the Kilsyth Hills. 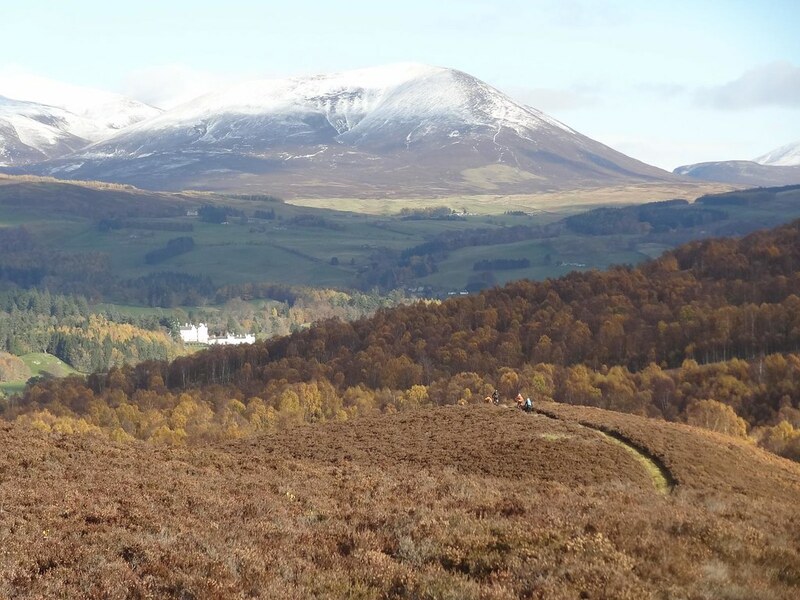 Davie has put a lot of effort into linking up the best trails in the area, and we were keen to find out what they were like. The first section started with a steep gravelly climb with some switchbacks thrown in for good measure, but once we had gained some height we were soon flying along a grassy ridge and admiring the views of the hills that we were due to head up. It wasn’t long before we reached the first ‘challenge’ climb of the day (these turned out to be a recurring theme…) alongside the Antonine Wall. I let Davie and Gerry lead the way on this one. 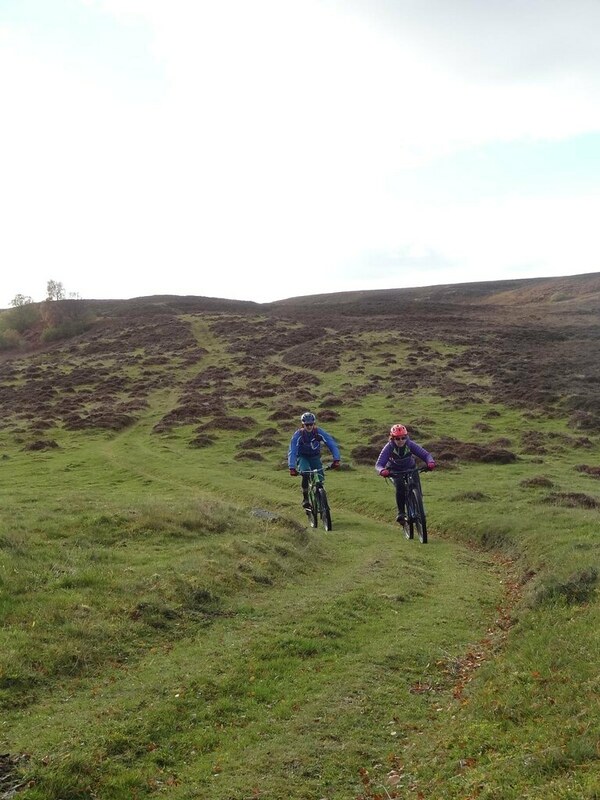 After reaching the trig point we then headed up to the Roman Fort at Bar Hill and down some rooty singletrack through the trees to Twechar and Kilsyth. 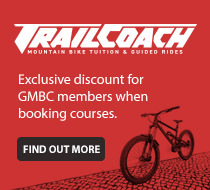 At around 2 hours, this would make a great Tuesday or Wednesday evening ride alternative. 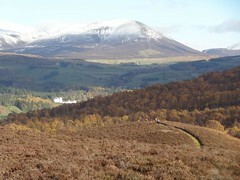 Next, we headed across the main road and onto a long climb behind Queenzieburn to the Birkenburn reservoir. 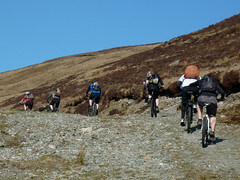 This was to be the second challenge climb of the day, taking us to around the same height as the Tak ma Doon road. When we reached the reservoir the sun came out and it was an ideal place to stop for lunch. 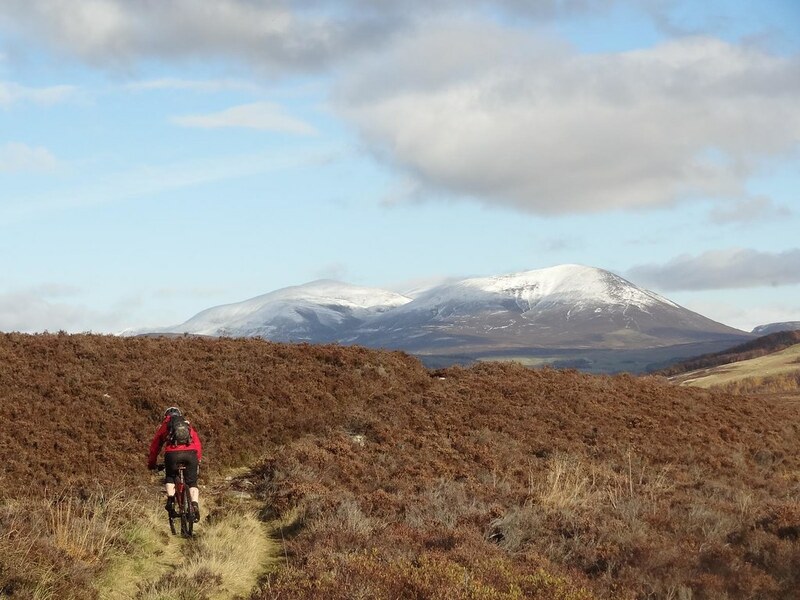 After scooting down some singletrack through the forest, we were suddenly in Carron Valley. 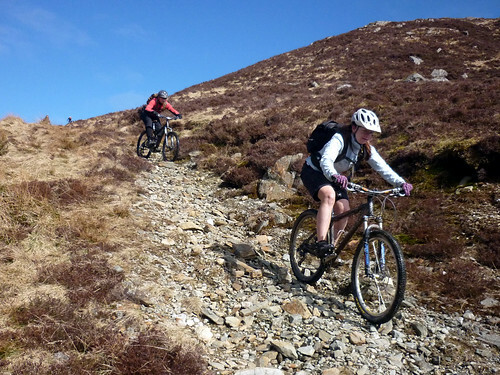 The option here was to either ride the Carron Valley cycle trails, or to climb up to the Tomtain cairn, which Davie assured us would be worth the climb. So, we opted to head to the cairn (challenge climb 3 – by this time I was flagging), and the 360 degree views were fantastic! By this time the sky had cleared enough for us to see as far as the Forth road bridge. 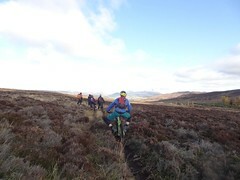 The singletrack descent took us back down the grass to the Tak ma Doon, so it was then a quick spin down to Kilsyth. A fantastic day out with a good mix of climbing and fun singletrack descents, well done to Davie for organising, and definitely a route worth putting on the official calendar. Total time: 5 hours approx. The British Summer Time period began today, the last Sunday of March. Nine happy soles set off from Aberfoyle for a loop off Ben Venue in glorious Summer sunshine albeit with a slight nip in the air. 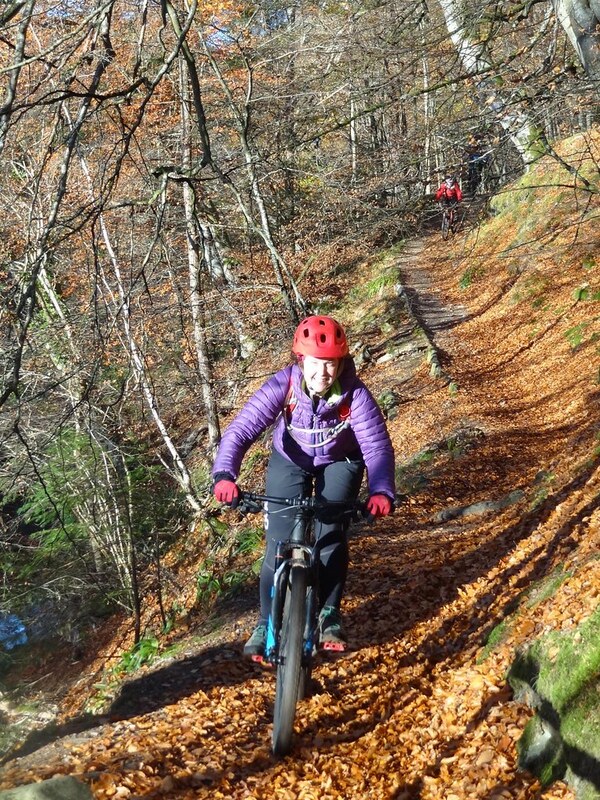 With Lyndsey fresh legged from her Lazarote Roadie Ride, she set the pace for the 3 mile road ride along to the opening of Loch Ard where Altskeith starts as quickly as it ends….still that wee section of road at the waterfront offers a wonderful view……no, not the legs! From Altskeith there’s a 6 foot brown gate on your right that begins the long 800m fireroad climb..that goes on…and on….and on, but the views are stunning. The first section of fireroad is relatively gentle that twists and turns up through the woods…not a ball buster by any means…yet! Further on up the fireroad Gavin stopped ahead rather promptly to do some Arobics or was it stretching, it was hard to tell, but no one slowed down to ask. As we amassed at the first junction, Gary stood playing with his iphone app, listening with fondness to his GPS coordinators soft spoken tones telling us how far we had come…I’m sure he just just enjoyed her company more than ours. With some 600m of climbing still to go , we all set off with Gav leading the way out of the forest…no sooner had he started spinning up the hill, he then stopped again, this time facing the wrong direction instructing the group that there was frog spawn and to take a wide berth…jeez, an Arobic instructor come Naturalist..is there no end to this man’s talents. Without doubt it’s as hard a climb as you could possibly want and as stunning a view that you could wish for in a clear day, unfortunately your nose is so close to the bars, it’s unlikely you would get the opportunity to see it unless you stopped. With everyone dragging themselves up the hill, I continued until the hill stopped me or I fell off with exhaustion…the hill stopped me, I fell backwards as the slope was so steep. With everyone watching on, I dusted myself off and tried again. 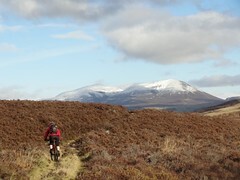 Eventually the wheels got traction and I set off on slow pursuit of the hut that lies just off the shadow of Ben Venue. With everyone at the top we sat at the hut and gazed around…The splendid vista includes Lochs Katrine, Achray and Venachar, Ben Ledi, Stuc a’ Chroin and Ben Vorlich…Beyond we could see Ben Lawers, the Crianlarich ‘Munros’ and Ben Lomond to name a few….Absolutely magic, and the views well deserved. After a quick few group photo shots and our lunch I decided we would take the singletrack that cuts onto the path toward the peak of Ben Venue instead of taking in the peak itself and towards Loch Achray…I though I’d discussed it, but it seems Lyndsey and Chris didn’t catch that bit and headed off to the right a little more than they should have! New guys Alan, Gary then Gav’s bro, Marky Mark etc. headed off to the left until we hit the singletrack. 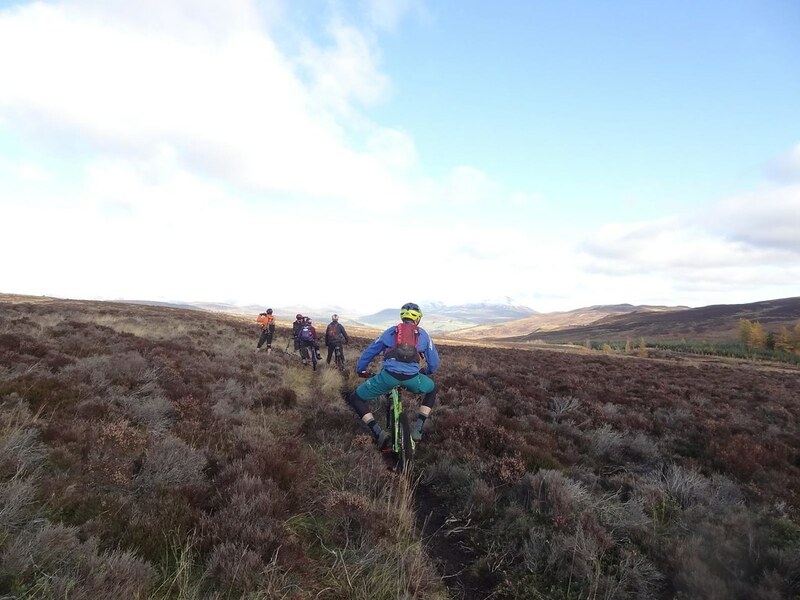 As we approached the Ben Venue Singletrack, Gary done well to get sight of it…unlike most of us who steered our way carefully onto the path, Gary thought he’d make more of an impact and go over the handle bars and rolled onto it….should have dropped the saddle! No broken bones we waited on Chris and Lyndz to join us after there wee diversion. 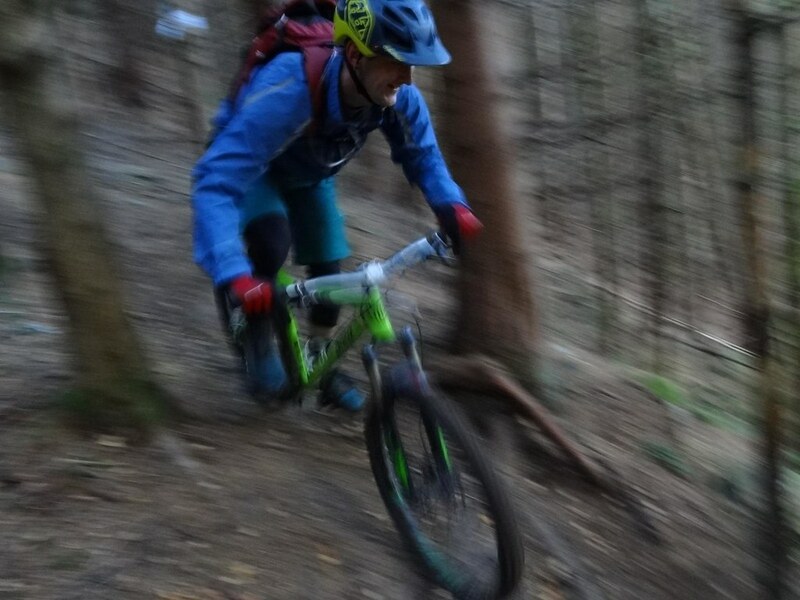 The track was a little broken up and quite technical in areas, however like most downhills you make the most of every opportunity…smiles a plenty. As we approached the bottom I asked Gav if he had spotted the Frog Spawn…..”no mate, was going to fast for that”…oh well nae tadpoles! 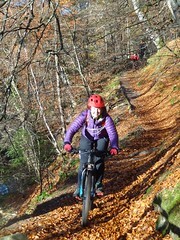 As we go to the bottom, we took in a loop of the forestry track around Lock Ard instead of the road back to Aberfoyle. After just under 5 hrs of riding we took in a cafe stop back at Aberfoyle for some tea and cakes. After telling everyone about the odd call, we assumed Elizabeth was stranded on the hill…… Like everyone else, I headed back to the car, got changed and packed up and went home. ….Elizabeth is safe and well. Alison was volunteered to do the ride report for today but in the meantime the photos can be seen on flickr at http://www.flickr.com/photos/mnw186f/ I know you can send them direct to my blog but I haven’t a clue how to do it . Perhaps the hall could be used for a club seminar on how to use wordpress by someone who knows what they’re doing? I’m sure i’m not the only one who is clueless. 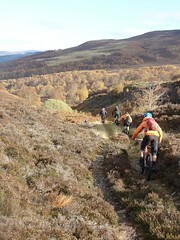 Good turnout today with 13 riders at the Menteiths after John Bennie’s suggestion earlier in the week. Myself and Simon Simpson left Kirki at 8:30 on the cross bikes to ride over to Aberfoyle via Mugdock, Croftamie and Gartmore. 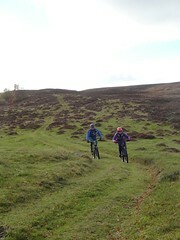 We were making good time until I had bad puncture problems just outside Gartmore. 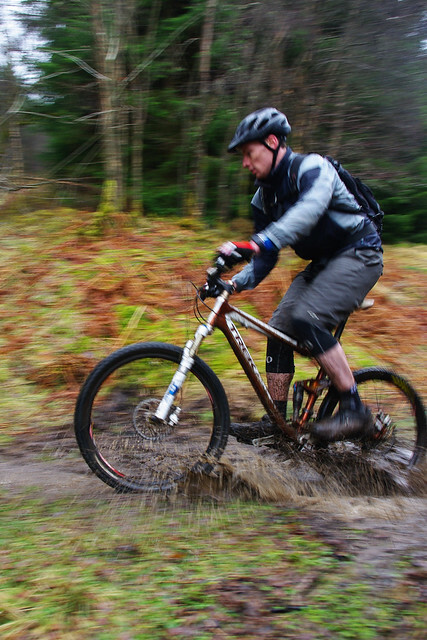 We phoned the rest of the bunch at Aberfoyle and they made a start on the journey with Big John (Sam’s Man) and Marky Mark leading the way into the very muddy Menthieths loop. 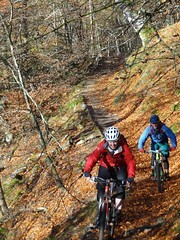 Unfortunately for Jacqui and Alison they had to wait at Aberfoyle with the mountain bikes. We managed to regroup at the picnic bench just after the lochs and grab a quick breather. Shortly after that, John led Anne and Mike (King of Trackstands) to his bikeshop (Wheels) and sorted them out with a rear mech hanger. Soon after, Mark needed to bail and catch Lyndsey who had been road biking in Lanzarote. The rest of us headed to The Byre and lots of high performance sports beer and chips were consumed, even by Neil who eventually succumbed to the temptation of a bowl of chips. There was some chat about some doing the Finglas loop but this was quickly squashed after talking to another couple of riders who informed us that they only just managed to ride 30% of it due to the snow. After lunch, Simon could not resist the temptation of some tarmac and dragged Jacquii over the Dukes to return to Aberfoyle. John led the rest of us back through the forest tracks to the trails just above Go-Ape where Sam was now in her element. This then just left a gentle descent into Aberfoyle. Arriving back at the carpark, Gary and Grant quickly loaded their bikes into John Bennie’s van and made a dash to the ice-cream shop for the drive back to Glasgow. In the car park, we then met Pistol Pete, Andy Mac and Derek who looked much cleaner after riding the Dukes and Katrine loop on the cross bikes. A great ride today, stuff to suit everyone and hopefully we will have plenty more good rides. 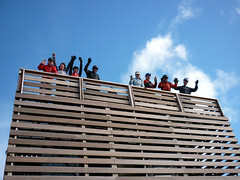 Some photos of Al Byford’s last GMBC Sunday ride (photos courtesy of Mark).